She arrives at the Olympia Farmers Market around 9:30 am on most Fridays, Saturdays, and Sundays. With impressive precision, she quickly sets up an umbrella, a table, and three folding chairs. Facing outward towards the market, the luscious garden acts as a backdrop. As ten o’clock rolls around, a customer strolls up and sits across from her, opening his hands and showing Amelia Romoff his palms. Soon, other customers are eagerly milling around just beyond her umbrella, ­­forming an informal line. Amelia Romoff is a psychic palm reader. At the Olympia Farmers Market, she has become a bit of a legend. Indeed, upon sitting down with her for a reading of my own, I immediately recognized her uniqueness and authenticity, which spreads far beyond her stand at the market. Wanting to experience the magic for myself, I sat down with Amelia Romoff for my very own reading. Her story starts right at the beginning. When she was born, she died. The doctors had to do an emergency C-section, resuscitating her. “Physically, I had passed away,” she recalled. According to Romoff, she remembers this pre-human “place” she was in as her true home, a place she yearns to go back to. “I remember a non-physical form that had an identity and was connected to everything. It felt so comfortable and so beautiful,” she said nostalgically. In fact, Romoff speculates that it may be this miracle entry into the world that could be responsible for her psychic talents. “I believe that I am not gifted. I believe that I have kept the talent of ‘baby language’ – that I ‘hear’ the way a child does. I use the full communication spectrum, which includes seeing and understanding energy frequencies that become invisible to most of us as we get older. To me, it’s another language, just one that most of us have lost,” Romoff explained. 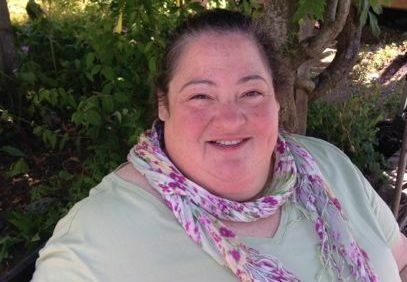 As a child, “being human” was very difficult for Romoff, who longed to go back to that “home place.” Romoff, a shy and quiet child according to her mother, was initially considered autistic. “I lived in the moment and I had a lot of trouble with school,” she recalled. In fact, it wasn’t until she was left alone to her own devices that she began to thrive. “When I was given up on educationally, I could finally let my imagination run wild, and that was when I began to succeed academically,” said Romoff. Those around her, wondering how Romoff had metamorphosed into a gregarious, talkative reader, were amazed. “Were you faking?” many of them asked her. “The thing was I didn’t have a lot of self-awareness. I never realized I was quiet or shy. I just felt like I didn’t have the words yet to articulate what it was I wanted to say,” Romoff explained. Amelia Romoff found her passion early on: connecting with others via palm reading. Romoff has been told that she started palm reading when she was seven. But she doesn’t remember that. What she does remember is a particular party where a woman, through her palm reading, was telling people what she herself had already told them. “With her, they were very receptive (they had been upset with me), and I realized it was the permission,” she recalls. From there, Romoff began pretending that she could palm read out of a desire – “a need” – to tell people things about themselves. “The library became my best friend and my greatest teacher,” laughed Romoff. Initially, she did readings for grown-ups with the support of those around her, particularly her mom. “It was never something I thought I would do as career,” recalled Romoff, who wanted to be a writer or a social activist in her younger years. While she attended the Evergreen State College, she barely did any palm reading. Then she began working with autistic people, which she loved. “They taught me a lot about using my imagination and other forms of communication besides verbal. The people I worked with were really good at astral projection, separating the mind and the body to commune in another realm. Most of it was imagination, but it seemed very real,” she said. It was in this line of work that Romoff developed her imagination. And it is her imagination that she taps into whenever she delivers a reading. “It blows my mind that I say whatever comes to my mind and I’m almost always right. To be honest, I don’t really understand how it works,” she confessed. 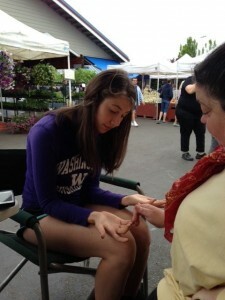 Although Romoff can’t remember her first palm reading, her mother has told her she started at the tender age of seven. As Romoff continued working with autistic people, she became increasingly sensitive. “It got to the point where I would walk around and I could just read everybody. I could see and feel their story,” she explained. 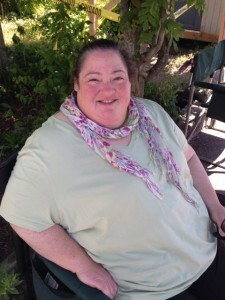 Without any awareness, she would share what she could feel with people. “My friends would tell me, ‘You just told that person to finish their novel and call their mother,’ and I would have no recollection of it,” she remembered. After a few years, she finally began to feel okay with accepting money. “As far as professional palm readers go, I charge barely anything. But I do need to support myself,” she said. 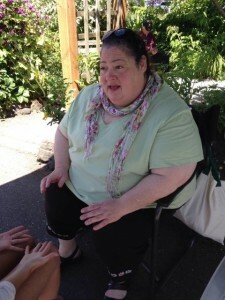 In addition to her palm reading venue at the market, Romoff is also available to do longer, more in-depth readings or group readings at parties through her business, Amelia’s Tree. Although Romoff doesn’t earn a lot financially, she is blessed in the fact that she has a calling, a purpose. “I see it as my quiet way of activism. I love that I can empower people, that I can see their good when they sit in front of me, that I can love them for that, and help them love themselves,” Romoff explained. 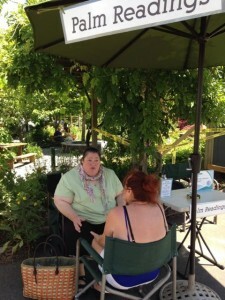 To get your own reading done, visit the market on Friday, Saturday, or Sunday. While Romoff now lives leisurely, life hasn’t been a cake walk. In fact, it took Romoff a long time not to consider herself “retarded” because that was what she was considered throughout her childhood. To console herself, she recognized that a lot of the world’s geniuses were suspected of being autistic – from famous musicians, Beethoven and Mozart; to writers, George Orwell, Lewis Carroll, and Emily Dickinson; to scientists, Einstein, Darwin, and Newton; to politicians, Hitler and Jefferson. At times in her life sadness and desperation have been overwhelming and “so, so loud. When I was little, I wasn’t shielded from the atrocities of war. I grew up in the 1960s right alongside the Vietnam War. To be able to stay alive and be part of the human race, I had to figure out coping strategies that would allow me not to feel ashamed to wear skin,” she explained, the gravity of what she has been through seeping into her voice. One of her main philosophies is that evil is a divine agreement. According to her, people encompassing evil are fallen angels who sacrifice their happiness and enlightenment to show the rest of humanity a life without love. “They’re awesome teachers, showing us the difference between love and hate. We can only become our highest self when we’re faced with evil. We all get tested regularly. If I can choose more often than not to love, to be joyous, to forgive, then I am doing it right,” she said. When you view someone as unique as Romoff, many people’s first inclination is awe and perhaps jealousy, a wish to be able to “read people” as well as she does. However, understanding her whole story, the strengths and weaknesses of her gift, is crucial. There are pros and cons. She has incredible empathy, inspiring compassion, and an amazing imagination. But it’s important to recognize that her imagination acts as both entertainment and as a shield, protecting her from things that may hurt too deeply otherwise. According to Romoff, this imagination has allowed her to accept her human form. “I’ve always found trees to be my best friends. I like to listen to them. They tell me stories – ancient times, modern times, they teach me about love, harmony and being together,” she explained. As she’s gotten older, she can speak more openly about these “stranger” parts of her life. “It could be real or it could not be. I don’t care. It makes me happy. When I don’t listen, I don’t want to be human. I don’t want to wear skin,” she said smiling. After listening to all types of beings, from trees to humans, Romoff emphasizes that “humans are pretty freaking happy,” we just don’t often realize it. “That’s the one thing I really love to do: remind people of their happiness.” Her bright, glowing aura has driven repeat business to her over the years. If you wish to visit Amelia Romoff, stop by the Olympia Farmers Market or check her website for more specific times and locations.